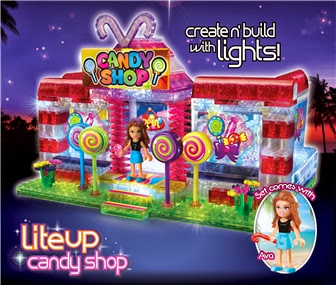 Lite Brix combines building bricks with funky lights and neon brights so they were an instant hit with the construction loving Mini Mes! Each set is suitable for children aged 6+ and although these two sets are aimed at girls, Jamster was keen to play too - he now has his eye on the Fire Station and Jet Fighter from the boys range! 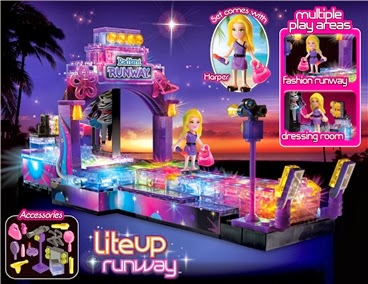 Building the Runway and Candy Shop took some time as although the instructions are informative and in a step-by-step style, the pieces don't click together and stay together well. I found that they lifted apart slightly when more blocks were added on but once fully complete the sets seem fairly stable. The Mini Mes created one each with some assistance, due to the blocks lifting, and I inserted the batteries (3xAA in each) for them which are not included. I also added the stickers which seemed to tear quite easily - I had to be gentle with removal from the decal sheet. The dolls are able to hold the accessories supplied (hair dryer, mirror etc) and their feet fit onto the blocks with ease so that they can remain standing in a position. With seats, cash register and other items in each set there is plenty to play with and keep little ones entertained. Once switched on we were all impressed by how well the lighting illuminated the transparent blocks. The different colours and flashing patterns were 'really cool'. The children were able to have the lights in their rooms switched off to play and really enjoyed this unique experience. WOW Great review - looks fab! My girls would love that for Christmas!!!! i've not seen this stuff before. It would make a great xmas pressie for my nieces.